Be careful when coming into contact with a wolf. Wolves are naturally frightened of humans and will go out of their way to avoid them. However human encroachment on wildlife areas and reintroduction programs in North America are forcing more human-wolf encounters. Wolves that have become accustomed to human habitation present the most danger. Running from a wolf is not a smart idea either, as this may indicate to the wolf that you are prey to be chased. 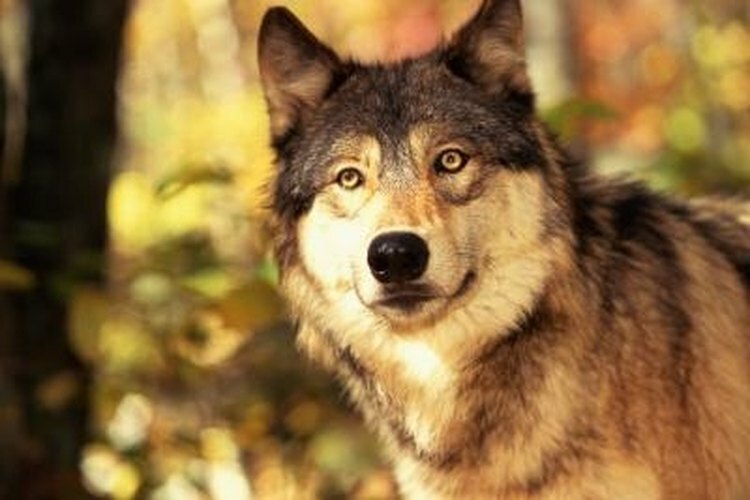 Scaring off a wolf is always a better option than killing it, and in many jurisdictions it is illegal to kill a wolf. Stand tall and shout at the wolf. Clap your hands and make as much noise as you can. By standing tall you appear bigger than the wolf and your vocalization will make you seem more aggressive. Bang pots and pans, or other metallic equipment together. This commotion should frighten the wolf and send it on its way. Play loud music. If the sound is louder than you can shout, it could drive the wolf away. Discharge a firearm in the air if it is safe to do so. Do not discharge a firearm in a populated area and do not shoot the firearm at the wolf. Throw something at the wolf. If there is nothing to make noise with, and shouting or clapping don't work, pick up a heavy object, such as a rock, and throw it at the wolf. Keep wolves away by not leaving food out. Also do not leave small children and small pets unattended. Always make lots of noise when traveling in wolf populated areas. Speak loudly or play music to warn wolves away before you come into contact with them. Based in Los Angeles, Ty Wright has written professionally since 1993, working primarily in film and television. His articles have appeared online at MadeMan. He holds a Bachelor of Arts degree in film and electronic arts from California State University, Long Beach.